Sixteen-year-old Jimi knows people change, but nothing could prepare her for what’s about to happen to her best friend, Del. Del is obsessed with becoming a chimera (ki-mir-a): a person who pays back-alley geneticists, known as ""genies,"" to illegally splice animal genes into their own. The resulting physical changes have scared lawmakers into drafting legislation declaring chimeras officially nonpersons—so when Del goes missing, Jimi is desperate to find him before he alters himself forever. As she tries to save him, Jimi must face down unscrupulous people and risk her own life—all while knowing that if getting spliced is the choice Del has made, it means he’s leaving her behind forever. Jon McGoran has written seven books for adults, including the eco-thrillers Drift, Deadout, and Dust Up called "outstanding" in a Publishers Weekly starred review, as well as the D. H. Dublin forensic thrillers. He is also the author of The Dead Ring, based on the television series The Blacklist. Jon McGoran is a founding member of The Liars Club, a group of writers dedicated to helping other writers, and co-host of The Liars Club Oddcast, a podcast about writing and creativity. 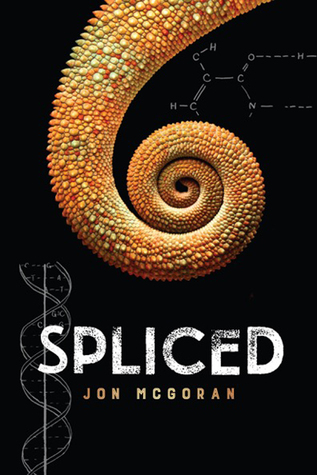 Spliced is McGoran's first book for young adults. He lives in Pennsylvania with his family. Noteworthy experiences while reading this book: The idea was pretty interesting but the execustion was lacking. Notes and Opinions: This book deals with back ally deals of teens paying others to splice their DNA with that of animals. This was a very weird book I was pretty fast paced but the story itself felt kind of choppy and a little confusing. I really didn't connect with any of the characters and around about 40% I decided that this one just wasn't for me and I had to put it down.